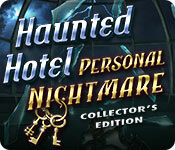 Haunted Hotel: Personal Nightmare Collector's Edition is rated 4.2 out of 5 by 42. Rated 5 out of 5 by wildweasel from Sometimes The Loser Wins -OR- Did He? Good Game; Crappy Ending, in the Bonus Game! Enjoyable game; the Map is a big help, although it won't help you find all the Special Feature Items. I can recommend this game. Rated 5 out of 5 by ArielACB from cant stop playing! CANT WAIT TO ORDER FULL VERSION AND PLAY! Rated 5 out of 5 by Majestyx12 from The Graphics blew Me Away I've never seen so many things moving at one time. I Loved it. Things would jump out or things on the wall would have a life of it's own. I Loved the motive of the people in the story and how they looked out for each other. I Love the Extras of a CE. You have Morphs and Fears that Morph and More Morphs in the Secret Room. I Loved the Bonus Chapter. I went to three different exotic locations. SPOILER ALERT. Treasure of Maya, Atlantis of Sands and Greenland. I counted 12 Hops in the main story and 4 in the Bonus Chapter. I Love the art of the Hops. My favorites are the stone carvings and Phoenix. In the bonus my favorites are Katy's world and plant. I'm not crazy about finding pairs behind items and they had 4 of those. I Love seeing Elephants in Elephant games which I found 4. I Love list Hops and they had several. I Loved the smooth game play. Most of the time I knew what to do. I Loved the throwback to three other Haunted Hotel games dealing with James. The three are Phoenix, Death Sentence and The Axiom Butcher. I'm a big fan. James looks different for some reason to me. Where is his bowler hat? The puzzles are Fun. My favorite are the stone compass for tracking animals and people, disk, color disk, color swap and in the bonus- fill the container with colored balls, shoot balls. Does any body like the tracing without touching the side? Not me. Luckily only one of those. 10 Wallpapers, 10 Concept Art, 4 Music, 13 Phobias, a Screensaver, Achievements. Replayable - 16 Hops and 12 Mini-games. The Secret Room are Morphs that are confined to Four Rooms. They have 4 Spiders, 8 Clown Masks, 12 Snakes, 16 Contracts and 20 Keys. This is my new Favorite Game. Rated 5 out of 5 by andibeard from Play It for the Experience So many times, games with creepy titles end up only being vaguely dark-themed and dark-colored but not truly creepy. This game finds its "creep factor" very nicely, but without crossing over into "truly disturbing." And the developers have worked very hard to create an immersive experience for the player. Every scene has some spooky treat for the eyes, including some true haunted-house style visions. The level of detail in the visuals is mind-boggling--from evil-looking chairs to apparitions flitting past the windows or strolling through the background. Pair that with the top-notch graphics and atmospheric music, and you have a perfect Haunted Hotel game. Here, the visuals transcend the story, and are the best reason to play the game (and the reason I give it five stars). The game play itself is fun, and a lot of thought went into the story and the puzzles. However, a few puzzles are poorly-designed (there was one I literally couldn't solve, even when I knew I was doing it correctly, because the controls didn't match the game action) and the developers relied way too much on the "fit the shape into the lock" solution, as so many do. I'm also not clear when the story takes place, as it seems a little old-fashioned in places but the characters don't look like they're from the past. However, I was so busy looking around at all the amazing details that the story seemed secondary. And even though it's not perfect, the story did have enough interest and challenge to keep me going. I like that it deviates from the standard "your ___ is taken by a crazed maniac/evil magic-doer and you must get them back" plotline, as here, the characters more or less willingly put themselves into the power of the maniac. And though the main character does have to rescue them, it's at least clear why everyone is there. I recommend this one for the atmosphere, if you like creepiness without gore! Rated 5 out of 5 by EzgiMelody from GREAT !! Another Great Haunted Hotel ! Nice and enjoyable game. Great Storyline. Thank you Big Fish. Rated 5 out of 5 by abbynormalusa from Another Great Elephant Game This caught my attention immediately. Graphics are great! 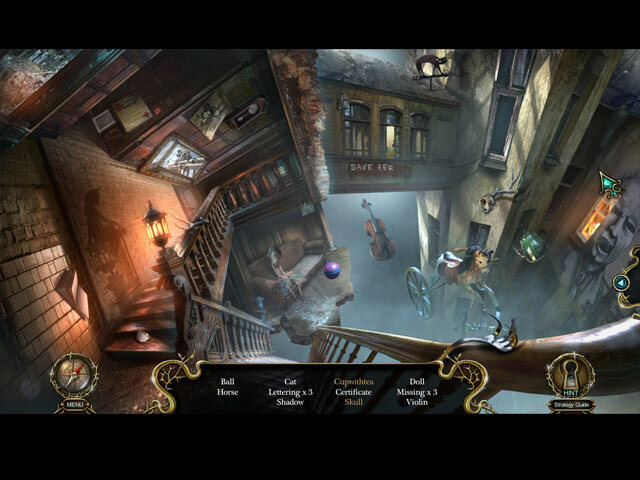 I enjoyed the extra puzzles to be solved; morphing, fear pics, and phobias. 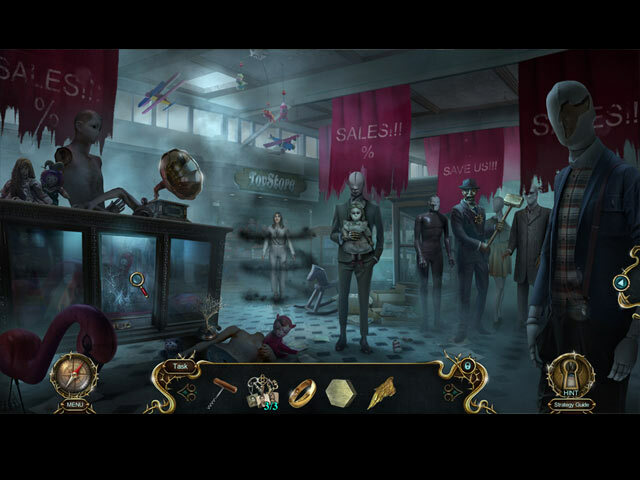 Along with the story line and the hidden objects this will certainly be in my collection. Again, one has a choice as how difficult to make the game. I chose the hardest level this time around. A great challenge for all players. Dianne, South Bend, IN. Rated 5 out of 5 by Ruckus777 from Unique and Spooky! Overall well-done and beautiful. Visuals were lovely and creepy, especially the loading screens! Gameplay was smooth, no huge lags. Enjoyable and engaging story. Thought it was cool and unique they ask (from a basic list) what your fears are. Won't spoil how that comes into play! I did the easiest difficulty (since sometimes I'm blind to the obvious) and it was a blessing at times to have the quick hints, but in hindsight it wasn't difficult. There were certain connections I couldn't make without the strategy guide but it just made me grateful to have it :) The voice acting and characters were also well done. Overall was just a great game, would recommend! Rated 5 out of 5 by kerith90angel from Based on completed game & details of CE content/bonus play The SE portion of the game took me 3:02 hrs. The bonus play took me 1hr The Secret Room took me 8 min. TOTAL GAMEPLAY with CE bonus play was 4 hr. 10min I play all of these games on custom mode. I complete all the HOS & try to complete the minigames but I’ll skip them if I become frustrated. I play at an average rate and run the stopwatch on my phone whenever I’m playing so it may take you more or less time. MOST IMPORTANT THINGS TO MENTION: ~The main game ends quickly, but conclusively and is independent from the CE bonus ending. ~ There were some great mini games in this game. The demo has a (challenging) arial obstacle mg of a black horse and rider that was fun. Page 20 of wtg has one for James I loved, Chapter 4 has a great toy train one on pg. 25 of wtg. ~ You play in many beautiful and eerie, outdoor locations. You don't just ramble around inside the hotel rooms. One fear was loneliness. "Mountain Spiral Road" just nailed that feeling. ~ Jump scares: I LOVED these animations! Most were in the demo but they did continue right on into the bonus play. Whoever did the animation for these....just perfectly done!!! You got me, more than once! ~ RE: MAP- I didn't find this map all that easy to read quickly so I used the portal hint and the strategy guide instead if needed. ~ COLLECTABLE ROOM FOR “PHOBIAS” (ce version) Important to mention, so you don’t miss out: Be sure to enter this page every other phobia or so because there are amazing animation visuals of each phobia just before each of these collectables. It would have been cool to just click on the statue & THEN see the little animation of the fear but for some reason the animation disappears leaving just a boring statue on the shelf. The animations for the clown, drowning & heights were just so incredible. I wanted to mention it here because I was sad I missed out on a few animations until I caught on they were actually disappearing. FAVORITE CHAPTER is #3- James’s chapter. I am such a fan of the handsome James and it was fun to see him again. We get to revisit a pinch of some prior HH in his chapter. The Axiom Butcher, Death Sentence, & The Phoenix are the ones that readily come to mind. This game did not have replayable videos OR a diary, only a useless task list. I often play more than one game at once and one or the other of these things is so helpful. It was missed. ABOUT BONUS PLAY- I preferred bonus play to the demo in this game as well and glad I bought the CE right out of the gate. The actual bonus play has 10 areas of play and of those, 6 areas are new and 4 areas we’d played in the main game. There are 4 new HOS to play and 8 new Mini games. You start out in the bonus story as Steven Blake again but luckily you find your dad George’s diary in the front yard of the hotel (what are the odds) ;) Too funny. Thankfully, it was still where he dropped it (a decade or more earlier) and not even ruined by rain! Thank goodness, because we need it to go back in time to 1931 and play some truly beautiful areas of this game in South America, Greenland, and an Egyptian themed area I loved. For Tomb Raider fans, like me, this feels like "Lara land". CE BONUS TABS ARE: (and what they do)- A lot of these remain locked until bonus play. Bonus play, 41 pg. in game wtg, 10 wallpapers dl to doc file, 10 dl concept art with logo, 4 music dl, replay 12 mini-games & 16 HOS, Achieve. pg., Phobia pg. (see above),Secret Room- unlocks after bonus is finished. You find multiple morphs over 4 rooms from the game and you can beat your time. It took me just shy of 8 min., PUZZLE PG is collectable page for 4 puzzles that assemble themselves. From the amount of CE's I buy from Elephant, I am willing to bet these were supposed to be 4 screensavers. Idk why they weren't all screensavers but only one of them will “SET” as a screensaver. I was really sad about that, because they were ALL such cool moving pictures. But I still love ya Elephant! I just love horses so if I could only have one of these save, they picked the right one. SCREENSAVER: This screensaver was worth it for me to buy the CE version (w-extra play too, of course). It's of that beautiful black horse you see in the demo. He is rearing, with the headless horsemen in a beautiful woodland scene with smoke billowing from his head. AMAZING! ABOUT THE 41pg STRATEGY GUIDE (aka-wtg) To give you an idea of how long the bonus play is compared to the demo- the demo was 8 ¼ pgs. & bonus play was 10 pages. I’m including each chapter’s pg. amount so you can gage how much gameplay is there. CHAP 1- Frank 8 ¼ pgs. (demo), CHAP 2- Mary 4pgs. CHAP 3- James 5 ¼ pgs., CHAP 4- Elizabeth & Kate 8pgs BONUS PLAY- 10 pgs., other-3 pgs. IF YOU LIKED THIS GAME HERE ARE SOME OTHERS LIKE IT: 1. Harrowed Halls: Lakeview Lane (has keys for locked fear doors too). 2. Sable Maze: 12 Fears (each chapter was a fear here too). 3. Bonfire Stories #1 The Gravedigger: (I had just finished the CE to Bonfire when I bought this HH & kept forgetting I was in a different game. It has the same colors palette & great play/story.) Many thanks to BFG & Elephant Games for many hours of fun and a game I will replay for sure. You keep making these CE with screensavers and I will keep buying them! ? Rated 5 out of 5 by garhawk from It scared the bee-jibbies out of me in the first 10 minutes! Elephant Games strikes again! OMG! I was hooked in the first 10-15 minutes of playing this game. I'm submitting this review with just playing about for an 1 hour. The graphics and jump scares makes the game for me. Also, the kid peeping through the hint keyhole did for me also. I love this game. The graphics, storyline and creepy crawlies are the best! 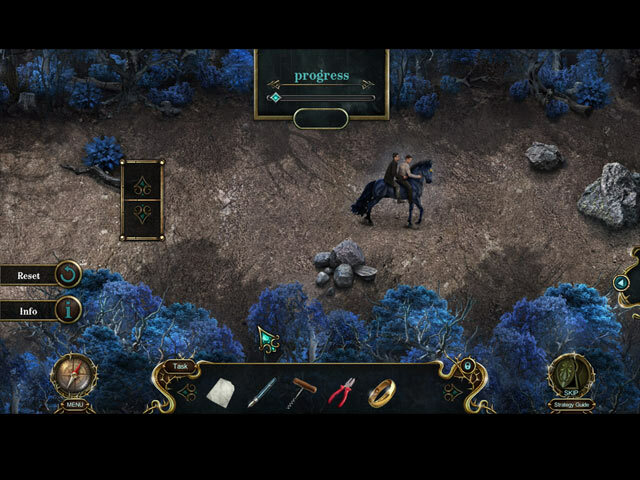 The games are not too hard; just challenging enough for me and the storyline flow is perfect. Whoever's in charge needs to give the devs a bonus! They deserve it!